Offering customized Body Lotion fragrances that reflect your personal scent. Furthermore, the products will reflect your very own personal scent. In addition, you can add your own colors. In conclusion, its all personalized for you. Seems like everyone should be so easy. As a result, we are here to cater to your needs. 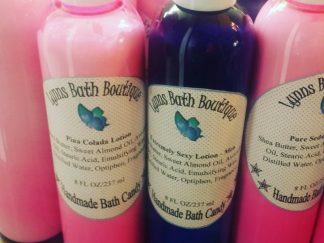 Consequently, most of all our handmade body lotions are nourishing to the skin and are made with shea butter, sweet almond, and avocado oils and emulsifying wax is safe for the skin. Body lotion designed to keep your skin moisturized yet formulated with these oils to be lightweight to the skin and nourishing to reveal and restore your skin’s natural beauty. Use as often as needed to hydrate and moisturize throughout the day or as often as needed. 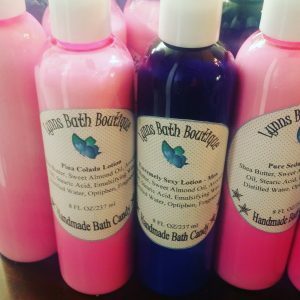 You find the perfect combination by choosing your fragrance and if desired you can choose colorants if so desired for your custom lotion; search our incredible scents. We use formaldehyde-free preservatives. Choose (1) or (2) fragrances from the drop-down menu. Equally important you also have the option to choose a light colorant if so desired. In conclusion, give our customized lotion a try today. Body lotion has many benefits and provides many benefits to people who make time to use it on a regular basis. Rejuvenate the skin any time of the day. Moisturizing properties for the skin. Feel and smell good and make your skin feel happy again. Soften the roughest parts of your body. Overall incorporating adding lotion to the body to your daily routine is a great way of improving the quality of your skin.